This is a toy bus my mom brought me a few years ago – it stands about 2 inches high and is just over 4 long. 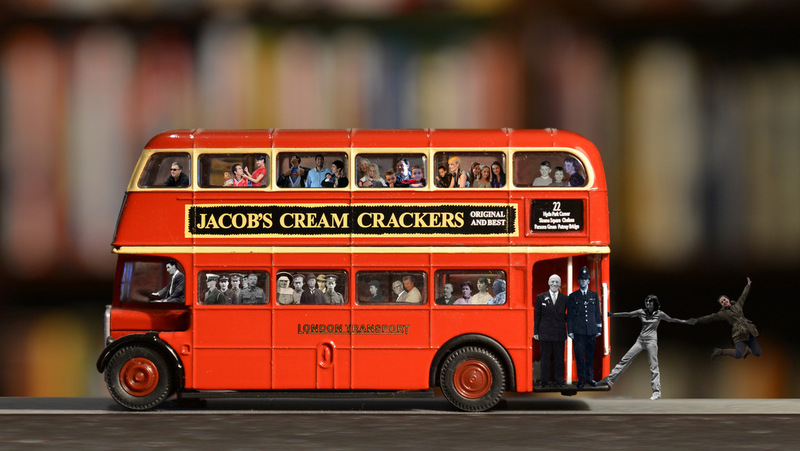 It is a model of the same bus my dad used to drive when I was a toddler, a RTW Double Decker. Sometimes I look at it and imagine him driving it – sometimes I also imagine my family along with my grandparents, great-grandparents, a good number of aunts and uncles coming along for the ride too. A nice thought! (PS to family members: I recognize some significant folks are missing, this because I don't have or can't find in my collection photos of everyone. But I will work on it and you will see significant relatives and missing significant others get on at some of the later bus stops).